I don’t know about ya’ll, but last Sunday after worship; I was exhausted! I hadn’t even helped out in the kitchen all morning for that wonderful Easter Breakfast as many of you did, but I just was wiped out. Monday and Tuesday I saw all sorts of messages from other pastors, even a blog post or two that showed I was not alone. All across Christendom, it seemed, us preachers were laying low Sunday afternoon through sometime Monday or Tuesday to recover from all the festivities. A few I know have been off all week. They never preach the low Sunday after Easter when guest preachers and Associate Pastors across the land typically are up to bat. . . . I know some of you were here Holy Week on Wednesday night (for choir rehearsal), followed by Thursday night for Maundy Thursday worship, Friday night for Good Friday worship, then shopping or cooking much of the day Saturday in order to get ready for Easter celebrations that began early in the morning Sunday through however your family went off from here to celebrate later that afternoon and evening. Maybe you too found yourself dragging a bit by Monday morning. Wishing that like the church office, you also could have been closed for the day after Easter. We weren’t even there for all the physical and emotional drama of the first Holy Week. So the level of our exhaustion may not have been as high as that of those first disciples. Come that first Easter Sunday evening, they still are locked away behind closed doors. Their hearts and minds have been put through the ringer, what with the highs of Palm Sunday and that Maundy Thursday supper only to be seized in terror a few hours later when in the dark of night in the garden of Gethsemane, their leader is rough up during his arrest. Drug off to wait in a dark pit under the house of the high priest for the sentencing and execution yet to come. The horror of those hours on the day that was supposed to be their Preparation for the Sabbath feast of Passover. Instead he was humiliated, tortured, and hung up to die. . . . By Holy Saturday, I can’t imagine which was deeper in those first disciples: the grief or the fear. Both are intense emotions that leave us human beings absolutely wrung out. Which might explain why, even after the news of the Risen Christ came to them from Mary Magdalene; according to the gospel of John, we find his first disciples behind closed doors. Locked away – if not to rest up then most probably to hide out. Either way, news of the empty tomb would demand a lot from them. If they weren’t about to be harassed by the same religious authorities and Roman soldiers who saw it done; then another much more terrifying, much more demanding visitor just might hunt them down. According to the gospel of John, he found them. He hadn’t come to make them more afraid; but I imagine the presence of the Risen Christ sent shivers down their spines. What now? . . . “Peace be with you! Receive the Holy Spirit!” he says. “As I’ve been sent; so now I send you!” Agh! The weight of his commissioning meets the weariness in their souls. It’s only the first Easter evening and according to the telling of the gospel of John, they’re already supposed to get out there with the message of God’s undying love. The same message that just a few days earlier, got their Lord killed. Might that be why a week goes by and still they are locked up there in that Upper Room? Coming back to give Thomas the first-hand experience he too wants, I kinda wonder if Jesus was a little miffed that the rest of them still are there. As the gospel of John tells the story, they weren’t instructed to hide out until the Holy Spirit would be given at Pentecost, fifty days after that first resurrection Sunday. According to the gospel of John, he came to them that first Easter evening with a gift and charge: receive the Holy Spirit and go too as I’ve been sent! No wasting time according to the gospel of John’s telling. It’s of the essence. Those first disciples are to get out there immediately to live the good news! Sunday after Easter, the lectionary sets this story as the gospel story. Fortunately we’ve had a whole week to recover from the weekend of the actual events, so when the gospel of John’s Risen Christ comes to us today, we don’t really have any excuse. Time is of the essence. While the sounds of the Alleluias, the smell of the lilies, and the leftover baskets of Easter bunnies remain; we hear this message: Go! Go now and tell the good news! Live out the forgiveness of God. Spread the hope we now know completely because of the resurrecting work of our God! Are you ready? Because what’s the point of Easter if it just leaves us exhausted each year? What’s the point of all the extravagant fanfare if we keep ourselves lock up tight behind closed doors? What’s the point if we’ve not once again been changed somehow? . . . This week more than any other, the people whose path we’ve crossed should have been able to sense the spring in our step and the joy in our hearts. If we’ve not grown brave enough yet to speak of our own experiences of God’s resurrecting power; then at least others should have been able to see something different in us. A deeper peace. A brighter joy. A firmer resolve to live a little bit more like our Christ – trusting that we too are God’s: precious, loved, and embraced now and forevermore. . . . We’ve just rehearsed the most incredible story of absolute grace. On the cross, while the worst in us human beings did to him the most unspeakable things, he said: “Forgive them.” If that’s not enough to melt our hearts and motivate our feet, then will anything? Christ is risen. And as his people, it’s time we get out there to tell. Not just some story about what happened centuries ago. No, the whole reason the Risen Christ appears to Mary Magdalene, and then to the rest, and finally to Thomas is so they don’t have to act only on some story someone else told them. We need to know that information and then we need to experience the joy of encountering the God who transforms everything – even death. We need to tell the good news of Christ living and dying and living again. And then we need to tell how we experience that same good news in the living of our days. How the Spirit of God comes to enliven us to face whatever. To give purpose for the living of our days. To be with us as we undergo some of the darkest moments of our lives. To whisper in our hearts through it all “I shall make all things new. I shall make all things new. I make all things new.” . . . Blessed! Blessed all those who don’t just let Easter wear us out but show us the truth we all need to hear – we all need to tell – we all need to live each day of our lives. 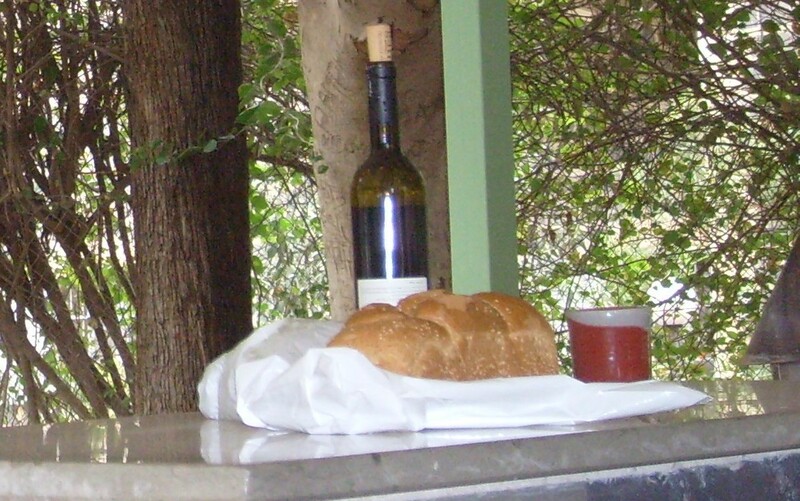 This entry was posted in Sermons and tagged 12 April 2015 sermon, Gift and Charge from the Risen Christ, John 20:19-31 sermon, Second Sunday of Easter Sermon, The difference of Easter on April 15, 2015 by RevJule.